In 1552 . . . In 1989 I spent a day at Horsetooth Reservoir near Fort Collins, Colorado, climbing (or trying to climb) a famous set of short, difficult routes on gorgeous sandstone. One problem in particular drew me: An overhanging face, perhaps seventeen or eighteen feet tall known as Left Eliminator. The route wasn’t impossibly hard, but the crux was scary—a big lunge to a sloping crack. I’d get into position to make the throw, then look down at my landing: A nasty slice of talus eight feet directly beneath my Symphysis Pubis. I had come to Fort Collins because of John Gill, a Professor of Mathematics known for climbing short routes vastly more difficult than any done by his contemporaries in North America in the 1950s to 1970s. That sort of climbing was called “bouldering,” but even in the 1980s, it was frequently thought of as mere practice for “real” climbs. Gill had written a few essays on the topic, but the most famous analysis of bouldering was a book by one of his friends and protégés, a Colorado climber named Pat Ament. Didn’t I try every Sunday one winter to do the left side of the Eliminator at Fort Collins? I eventually got the lunge on that climb down well enough to bloody my left hand consistently on the hold. But not hang on to it. I’ve seen pictures of him doing it without a rope. Ament and Gill helped to legitimate bouldering, partly by representing the sport as an artistic or even spiritual practice. In the 1970s, this weird, little subcultural corner of mountaineering had also become one of the sport’s most philosophically reflective. Today, as I return to Master of Rock, I am struck by the way it documents a particular moment in American history. The visual cues are the most obvious—the khakis and Bermuda shorts, sports shirts and crew cuts, imported Kletterschuhe, even Gill’s small trailer on old range land near the public university. Gill’s pilgrimage from the Deep South to the Rockies now looks like period piece. Gill learned of alpinism from friends, movies and magazines. Instructed by an entry in Encyclopedia Britannica, he got a Tyrolian hat and Vibram soles. Obscure cliffs in the mid-South, vacations in the Rockies and Tetons, and college gymnastics followed. A chronicle of Gill’s professional life reads like a gloss of American Cold War culture. The federal government’s investment in research and higher education, especially in scientific and technical fields, created a world in which a young math student could move from Georgia Tech to the University of Georgia, pick up a Master’s at Alabama, then teach at Murray State in Kentucky (with stints in ROTC and the Air Force), before settling on a Ph.D. program in a small state school in northern Colorado. In the 1960s, Gill moved to Fort Collins to attend Colorado State. Ph.D. in hand, he found a tenure-track position at the University of Southern Colorado, Pueblo. Colorado was one of those Sunbelt places that capitalized on Cold War investment in scientific and technical research. NORAD, the National Center for Atmospheric Research, and a growing assortment of private firms helped to generate a demand for mathematics. New money and inmigrants in engineering, defense, and related support industries began to displace the ranching, mining and agricultural interests that had dominated the state. Although Colorado was the provinces when it came to academia, it was one of the capitols of period climbing. El Dorado Canyon, Boulder Canyon, and the Flatirons offered technical rock climbing close to the college town of Boulder. Rocky Mountain National Park had high peaks and a famous wall, The Diamond. And the new capital helped to support a growing population of part and even full-time climbers. Gill’s routes helped to put the Front Range on the map. Moreover, Gill’s career made him both emblematic and unusual. After settling into his post in Pueblo, where the teaching load was punishing and the support for research minimal, Gill not only kept climbing at an elite standard, he also continued to do serious research. That mix of career and climbing had already become unusual. The Victorian ideal of the bourgeois intellectual who climbed at holidays and summertime, had faded. There were some expert climbers with healthy family lives and professions. But most of the athletes of the 1960s who truly altered climbing also made careers in or along the edges of the sport: guiding, journalism, importing, designing and selling climbing gear. Gill was the last amateur. Simply saying “dynamic movement” rather than “jumping” or “throwing” for holds, helped to make dynamics sound respectable, especially as “dynamic” was a keyword for a mid-century America in love with engineering. The simple act of swinging or springing for distant holds was a bold, and in some corners, disreputable innovation, but Gill made dynamics part of an entirely new vocabulary of moves. Recently, the originality of Gill’s movement came home to me when I attended a screening of Pat Ament’s The Disciples of Gill. A meditation on climbing and aging, the film also included older footage from Ament’s wonderful 16mm document, The Silent Climber, of both Gill and Jim Holloway in their primes. Gill’s climbing aesthetic amazed the younger climbers in the audience. That style had grown partly out of Gill’s background in formal gymnastics, especially the rope and still rings events as they were practiced in the 1950s and ’60s. By 21st century climbing standards, the approach was old-fashioned—movement initiated from the upper-body, hips square to the rock, a clean straight line from shoulder to toe, polished performances of routes well within Gill’s limits. The rise of climbing gyms and softer shoes in the 1990s helped to produce a different type of movement: hips turned for reaches, toes curled round holds, feet splayed to pull the body close to the rock. And the 21st century emphasis on pure objective difficulty, rather than aesthetics of performance, had made sheer desperation the standard mode of climbing videos. But with Disciples of Gill, the audience could watch Gill perform routines he had rehearsed and polished until he appeared to float. The boulderer is concerned with form almost as much as with success and will not feel that he has truly mastered a problem until he can do it gracefully. On recent research trip to Colorado, I spent a few days in the archives of the American Alpine Club Library in Golden. Gill drove up one day to meet me for lunch, and we talked about the changes in Colorado and higher education generally. Tech money was still pouring into the Front Range, but not much of it seemed to find its way to public institutions. While the houses got bigger and fancier, the Universities got poorer. Budget cuts meant that the Special Collections at CU opened for only a few hours of the afternoon, a few days of the week. As I told Gill, on Monday I’d found myself at liberty, because none of the archives were open at all. So I had driven up to Horsetooth Reservoir. I’d had twenty one years to think about that move on Left Eliminator. Or rather, I’d had twenty one years to think about retreat. The route was as I’d remembered it– clean and steep with a bad landing. I tightened the laces on my soft shoes, pulled onto the rock, curled my toes round a foothold, and reached for the crack. A few seconds later, I was on top. pictorial representation may be this one, sketched by Thomas Ayres in 1855. The version you see here is a scan of the original, part of The Robert B. Honeyman Collection at The Bancroft Library at the University of California, Berkeley. The image shows Yosemite Valley as European Americans experienced it in the 1850s: open and lush, sculpted by generations of flooding and the Native American use of fire as a land management tool. The Valley had more meadow, and less forest and brush, than it does today. But the drawing is also useful as an example of the ways that period observers saw mountain places. The line of cliffs here is almost flat, and the artist has steepened the lower profile of El Capitan (the prominent cliff on the left) by at least 10 or 15 degrees. Half Dome is difficult to pick out in the far distance– unlike later artists, Ayres did not lead the viewer’s eye deeper into the Valley. In his mountains, things feel steeper and flatter than they would appear in most photographs, let alone in the flesh. Although digitized to high scholarly standards, much of the sketch is difficult to make out online. In person, the drawing is vivid– Ayres used chalk, charcoal and pencil on a very rough, textured sandpaper. He enhanced detail by scoring or fletching the surface with a knife or razor. For serious scholarly work, and even for entertainment, there’s no substitute for the original object. I recently met a colleague– a terrific economist with an interest in history –who assured me that libraries and archives were dinosaurs. Each and every significant document in the world would be scanned, digitized, and then posted online, he told me. Google or some consortium could simply hire thousands of clerical workers in Bangalore to do the dirty work. Once that task was complete, archivists, librarians, historians and their institutions would disappear. How would you detect fraud? How could you prevent the uploading of falsified documents, modified documents, endless versions of The Protocols of the Elders of Zion? Who would certify the provenance and authenticity of these objects, date them, organize them so they could be searched and used? What about the vast quantity of documents– like our 1855 sketch –in which much of the information lies in the body of the object– its fibers, colors, and texture? Such questions had not occurred to my colleague. In the case of The Honeyman Collection, we have a selection from a larger set of materials at The Bancroft Library, one of the most important (and public) research libraries in North America. These sources have been carefully acquired, authenticated, conserved, and organized by finding aids. Each of these steps took skill, experience, time and money. To digitize the images for scholarly use, Library staff had to make still more decisions about resolution, color, and so on (read, for instance the Senior Photographer’s note on imaging). 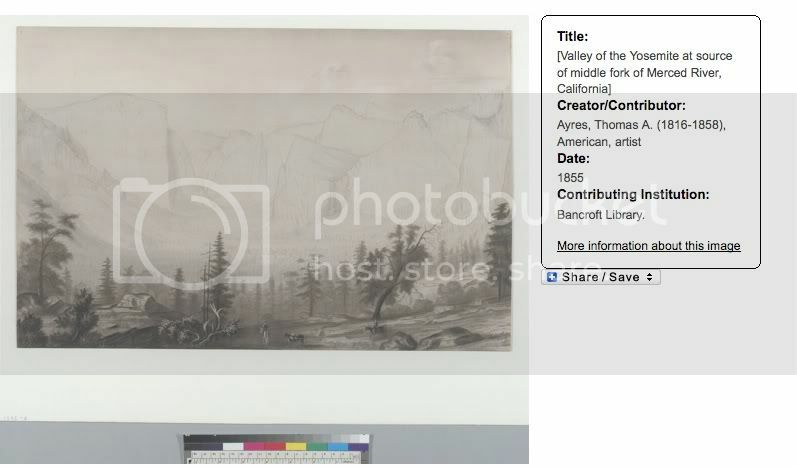 The end result is a trustworthy digital collection that reduces wear and tear on the objects, helps to make an amazing set of primary sources visible to classrooms and buffs, and that can be used as a starting point for serious historical research.